Bottling your home brew is one of those processes that most brewers dread because of the cleaning, sanitization, and boring repetition involved with it. I personally try to avoid it and instead keg my beer when ever possible or practical, but it is not always an option. 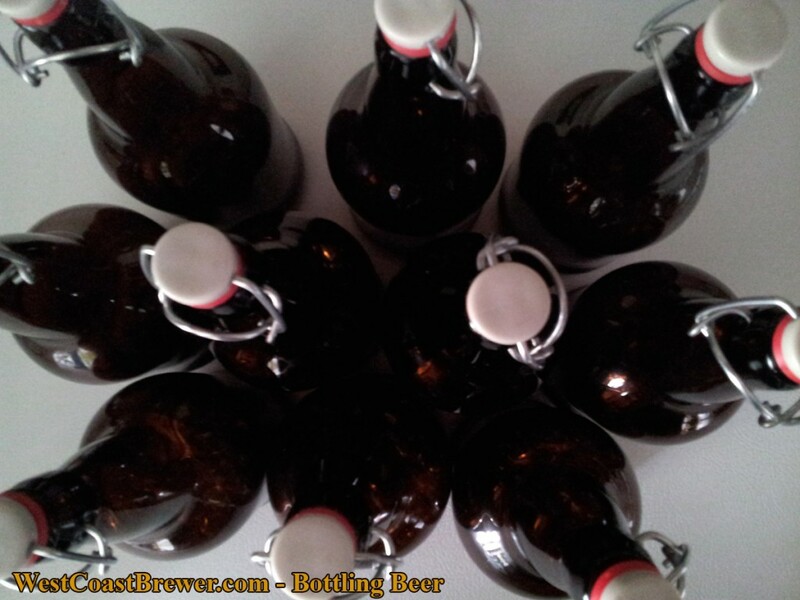 When bottling beer, I do my best to make it as easy as possible. I used to recycle old beer bottles, which involved several rounds of soaking and scrubbing to get the labels off. Since then, I have opted for large format 1 liter, ez cap/latch top bottles. What I like best about these bottles is that they hold approximately 32 oz of beer, so that means fewer bottles to clean, sanitize, and fill. Since they are latch top, it also means that I do not need to deal with the process of capping my bottles. If I give a bottle to a friend, I just make them promise to return the bottle clean to make my life a little easier when it comes to refilling. 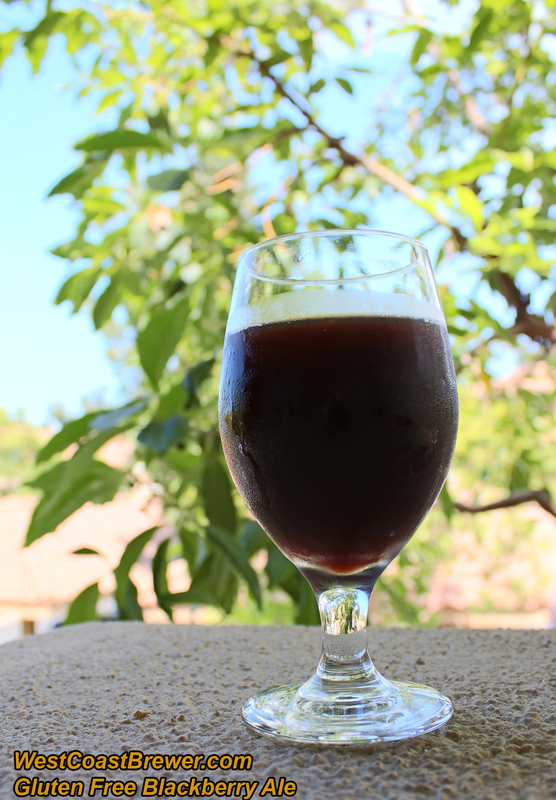 As far as carbonating bottled beer goes, you have a couple of different options. I typically first carbonate my beer in the keg, and allow it to clear before bottling. This process allows for a cleaner tasting and clearer beer since the yeast has already dropped out and fermentation is not active in the bottle. Your other option is to create the CO2 for the carbonation process by allowing the beer to continue or complete the fermentation process while capped in the bottle. The safest and most dependable method is to allow your beer to complete the fermentation process in the fermenter and then adding a calculated amount of sugar to the beer just prior to bottling so that the proper amount of carbonation can be achieved. It is critical that you do not add too much sugar, as it will produce excessive CO2 and that can cause the bottles to shatter. One last note: For great tasting beer, it is critical to clean the bottles and then sanitize them first. If any bacteria or residue remains in the bottle prior to filling them, you can ruin your beer with other flavors and funk! Happy brewing. Click here for general beer bottling supplies, including bottle fillers. Cleaning and sanitizing your home brewing equipment is perhaps the single most important step in the home brewing process. Without proper cleanliness, your home brew is almost certainly going to suffer off flavors caused by organic compounds, residues, bacteria or fungus. 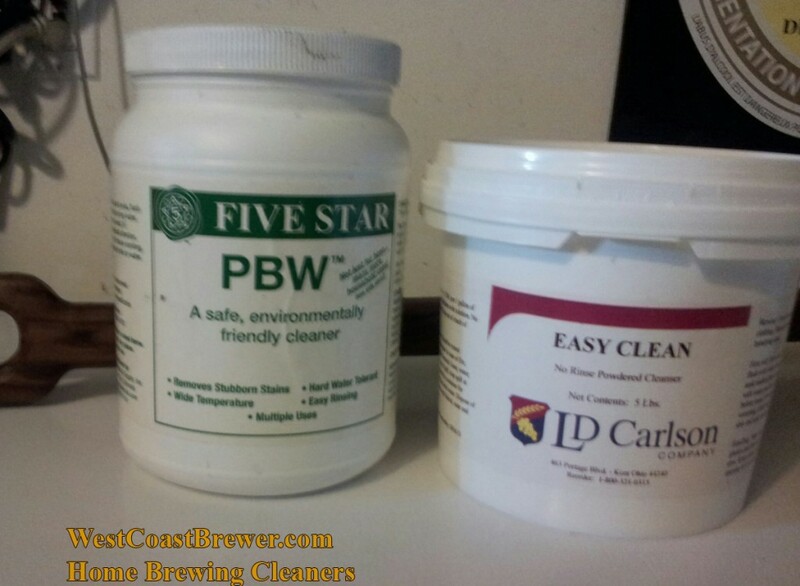 In today’s blog entry, I am going to review some of the popular home brewing cleaners that are available on the market. There are two typical types of cleaners available to home brewers, oxygen based and alkali based. Perhaps the most popular alkali cleaner is PBW or Powdered Brewery Wash. PBW was originally developed for Coors Brewing Company, but is now widely used in many large commercial breweries. PBW should be diluted to 1 to 2 ounces per gallon of warm water for cleaning kettles and chillers, and approximately 3/4 ounces per gallon of warm water for all other equipment. If time permits, it is best to soak equipment for approximately 12 hours in PBW solution and then rinse. PBW is capable of dissolving most organic brewing compounds without the need for scrubbing and is safe to use on all standard brewing equipment, including stainless steel. Powdered Brewery Wash is my cleaner of choice. The most widely used oxygen based home brewery cleaners are Easy Clean and One Step. The main advantage to these cleaners is that no rinsing is required, but they are not typically as effective as PBW at removing tough stains or cleaning hard to reach areas. It is important to keep in mind that cleaning is only the first step in preparing your fermentation, racking, and bottling equipment. You must also sanitize your equipment to insure that it is free of bacteria or fungus that could compromise the taste of your beer. The above mentioned cleaners can be purchased here. There are right and wrong ways to store your hops to keep them as fresh as possible for future brewing and dry hopping. In this blog entry, we are going to cover some best practices for preserving the quality and potency of your hops when storing them for an extended period. First off, it is important to be aware that hops are constantly degrading, and at best, all we can hope to do is slow the process down. As time passes, the resins, acids, and oils in the hops break down and the potential for aroma and bittering is drastically diminished. The two greatest causes of hop degradation are temperature and exposure to oxygen. The colder you can store your hops, the better, as it will slow the rate of oxidization. 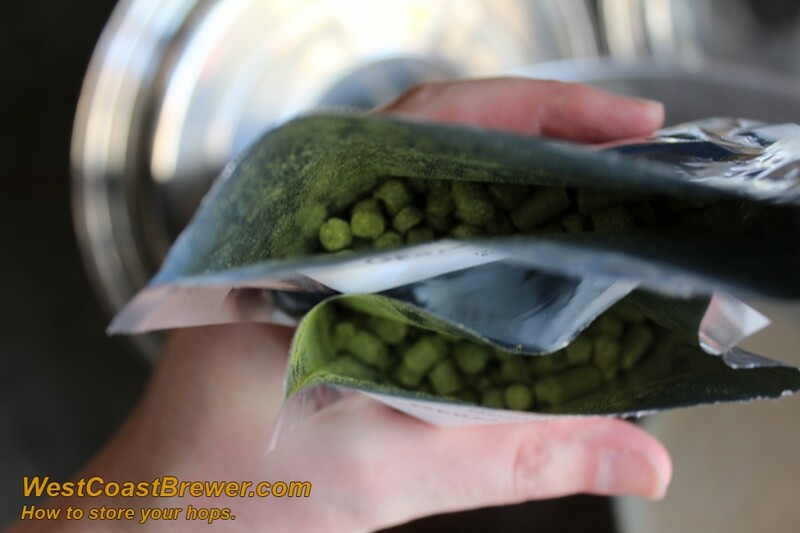 Ideally, you want to store your hops in a freezer with a temperature of less than 30F. If possible, strive for a temperature closer to 20F, and do your best to make sure that the hops are vacuum sealed and free of any moisture when frozen. Oxygen is the true nemesis of hop freshness. Do your best to keep your hops properly sealed in a bag that is resistant to oxygen permeability and flushed with nitrogen. If you do not have access to a vacuum sealer, use a Ziploc bag, and remove as much oxygen out of the bag as possible. If you have stored your hops for longer then 12-24 months, you will probably want to consider replacing them with some fresher hops. It is difficult to know how fresh the hops were when the supplier received and packaged them, so at that point they may already be 3 years old, and their bittering potential will be very difficult to predict. If the hops are brownish in color, and the aroma is faint or unusual, they should be discarded. Northern Brewer has a great selection of well-packaged hops and I purchase most of mine from them. You can view their selection of hops here. How to store hops to preserve their freshness. I just finished up my most recent batch of beer! It was a 3 gallon extract batch of gluten free blackberry ale. It has a nice balanced flavor with a tart finish. If you are looking to brew an extract batch of homemade gluten free beer, I highly recommend it.